Digest Basic Essential Digestive Enzymes by Enzymedica Enzymedica - Digest Basic Essential Digestive Enzymes - 90 Capsules. Enzymedica is proud to offer Digest Basic which is intended as an introductory enzyme product that is appropriate for the entire family . 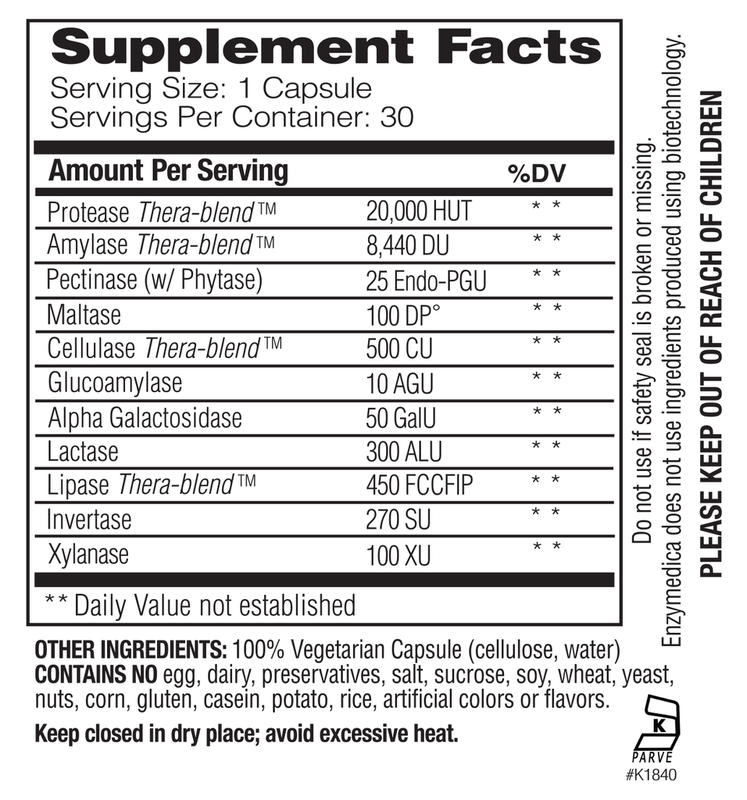 This formula utilizes Enzymedica's exclusive thera-blend technology for blending the plant based enzymes protease, lipase, amylase, and cellulase. They are essential enzymes that assist in the digestion of proteins, fats, carbohydrates, dairy products, and fiber. They also exist in a broader PH range that creates the ability to break down more bonds. In simple terms, thera-blends work longer in the body and have further reaching abilities than single enzyme products possess on their own. At any age one can benefit from natural enzyme supplements that enhance digestion and encourage more healthful elimination. Digestive enzymes are critical since they convert the food one consumes each day into usable energy for the body. This process can increase immunity and prolong the longevity potential for overall optimal health. Raw foods alone are not enough to produce the amount of digestive enzymes ideal for the matinience and repair of living cells. Because of the processed and mainly cooked nature of the modern diet and the toxins humans have to endure each day, the majority of enzymes a person can benefit from are destroyed on a regular basis. This is why Enzymedica is here to introduce natural alternatives to seemingly inevitable enzyme deficiencies, with products like Digest Basic, which is an 100% vegan/vegetarian system that contains no fillers (chemical or otherwise) and is free of common allergens such as gluten, soy and casein. The capsules are also engineered to be small enough to accommodate those who on average have trouble swallowing capsules. It is also an excellent choice for people who have experienced sensitivity to high potency digestive enzyme supplements in the past. Cover All The Digestive Bases Digest Basic is a gentle potency digestive formula which contains the essential enzymes needed to support the proper digestion of all four major food groups. There is no need to purchase all of those enzymes in singular formulas when they are so successfully combined already to create this one product. As a introductory system it is not only appropriate for almost any age group but also to those individuals who experience sensitivity to higher potency digestive enzyme blends. When taken with each meal it can assist in the decreasing of energy used up by the body for digestion and convert that energy into healthy living cell production and optimization. This can lead to increased longevity and a greater sense of physical well being. By encouraging more healthful elimination Digest Basic can also increase the nutrients one receives from foods consumed, in both quantity and quality. In addition to these benefits, it may also aid the relief of common digestive ailments such as heartburn, bloating and gas. Enzymedica's Mission: Enzymedica is dedicated to providing exceptional enzyme-focused supplements at the most therapeutic levels available in the natural foods industry and beyond. It is their commitment to provide unprecedented education and research that propels individuals on the path to vibrant health. Enzymedica's entire focus and purpose is enzymes. They are the experts. Unlike most of their competitors, Enzymedica does not make vitamin supplements or herbal cleanses. All they manufacture are the highest quality, highest potency enzyme products available. Enzymedica products are Health Professional proven. Enzymedica products contain the highest therapeutic activities available. No other company uses higher active units in a multiple enzyme line. In addition to a digestive enzyme that is on average three times stronger than their competitors, Enzymedica has a therapeutic digestive enzyme blend, a carbohydrate digestion and allergy assistance blend, a blood purifier, and a fat digestion and cardiovascular product. Enzymedica is proud to be GMP Registered through NSF International. Good Manufacturing Practices (GMP) are guidelines that provide a system of processes, procedures, and documentation to assure the product produced has the identity, strength, composition, quality, and purity that it is represented to possess. NSF International helps protect you by certifying products and writing standards for food, water and consumer goods. As an independent, not-for-profit organization, NSF's ongoing public health commitment is to encourage everyone to live safer. The NSF GMP Registration for contract manufacturers and internal manufacturing facilities of dietary supplement companies enables contract manufacturers to become independently registered by NSF as complying with GMP requirements as listed in Section 8 of NSF/ANSI Standard 173-2006. NSF's Dietary Supplement Standard is updated to keep pace with FDA GMP regulations. Enzymedica uses an exclusive Thera-blend process for its protease, lipase, amylase and cellulase. This means that each of these enzymes actually represents multiple strains. For example, there are actually four proteases in the Thera-blend protease. They are blended for their ability to break down numerous bonds of protein in varying pH levels. Enzymedica does this at a considerable expense. From a label description Enzymedica also sacrifices active units to provide the best blend possible. A single protease, for example, could produce more active units per milligram than a multiple protease. However, the active pH would be narrow and the number of protein bonds it could break would be limited. Enzymedica products are 100% vegan and vegetarian. Enzymedica uses no fillers in any of its enzyme formulations. You will no doubt notice how small the capsules are in comparison to similar products. This is a result of using concentrates with no fillers. Research Efforts Enzymedica continues to research the therapeutic effectiveness of plant based enzymes through doctors and clinicians. Currently, the company is coordinating and funding research that is ongoing. Enzymedica has every batch third party tested. This ensures they always meet label claim. Enzymedica Digest Gold- is also available. Digest Gold differs from regular Digest in a couple of important ways. First, Digest Gold contains four more enzymes than Digest. These enzymes help with digestion of soluble and insoluble fiber, along with beta-glucan and carbohydrate metabolism. The second difference is the increase in active units. Digest Gold is approximately three times stronger than Digest in most categories.